Move over Microsoft. One of the world’s largest smartphone makers has decided to enter the PC marketplace with the launch of the MateBook 2-in-1 tablet. Well, maybe not, but they have certainly taken a page out of the Microsoft playbook with their first tablet. This is a 12-inch tablet with a 3:2 aspect ratio. If that sounds familiar, that’s because it’s exactly the same aspect ratio and size as the Surface Pro lineup. Just like Lenovo and others, manufacturers are seeing the relative success of the Surface Pro and want their own piece of the action. And that’s great for all of us. 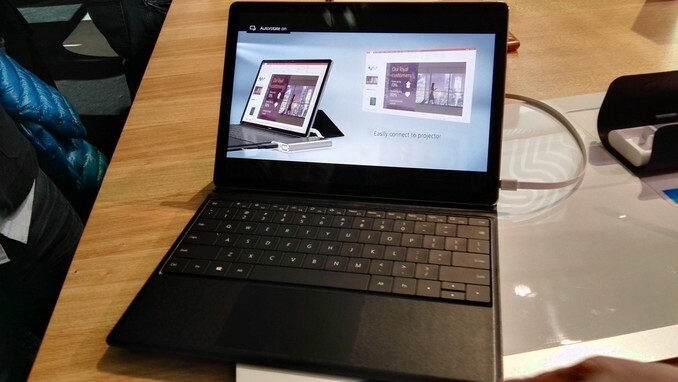 Rather than compete head on with the Surface Pro though, Huawei has gone for a slightly different target. The MateBook is thinner, and lighter than the Surface Pro, and it is designed around the Core m platform, so it is completely fanless. Only the base model Surface Pro can be had with Core m. Other notable internal items are 4 or 8 GB of memory, and 128, 256, or 512 GB of SSD storage. Battery capacity is 33.7 Wh, and Huawei says this gives all day battery life, but we’ll have to see if that’s true. The tablet itself is only 6.9 mm thick and weighs just 640 grams (1.4 lbs). The MateBook also comes in several hundred dollars less than the Surface Pro, with a starting price of $699, and goes up to $1599 with Core m7, 8GB of RAM, and a 512 GB SSD. The display is a 12-inch 2160x1440 LCD. You can’t compete against Surface Pro without accessories, and the MateBook has both an active pen and click on keyboard to transform it into a laptop. The keyboard has backlit keys with 1.5mm of travel, but the actual keys themselves are very much like the Surface Pro 3 keyboard rather than the much improved Surface Pro 4 design. The tablet also lacks a kickstand, and instead the keyboard dock does some clever folding to hold the display up when it’s docked. The keyboard connects with pogo pins, so you don’t have to worry about Bluetooth connectivity for the connection, or batteries in the cover. The cover will sell for $129. 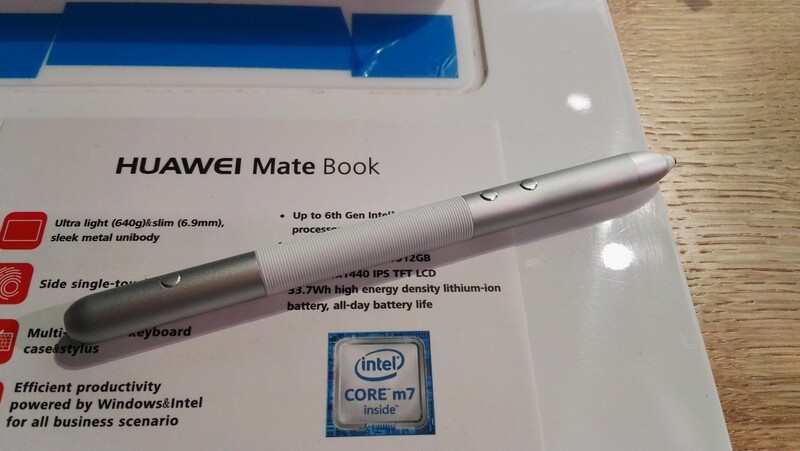 The other accessory is an active pen, and while we don’t know the pen technology at this point, Huawei does say that it has 2048 levels of pressure sensitivity. It also features a laser pointer in the pen for use during presentations. The pen charges over USB, and one hour of charge gives one month of use. It’s great to see a new entrance into the PC space, and Huawei has designed what looks to be a pretty nice tablet for their first attempt. 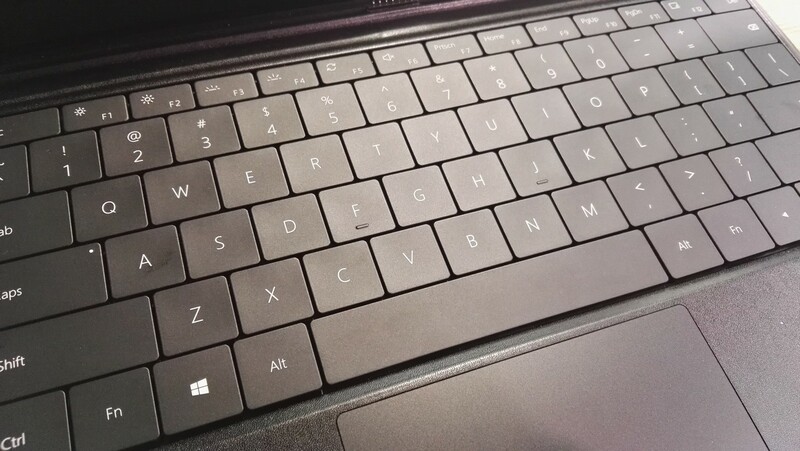 The Surface Pro is definitely the inspiration for the MateBook, and that’s not a bad thing, but the keyboard has been improved a lot of the latest tablet from Microsoft, and the MateBook type cover appears to mimic the prior generation here. Also the display is a much lower resolution panel than the latest offering from Redmond, but it does match the well received Surface Pro 3 model. I’m very excited to see another entrant here though and hopefully we can get this in for review to see how it stacks up. Agree. These high-end tablets are clever scams like freemium games. "Hey look, I sell you a very cool and fast tablet for affordable price." You buy it and realize you need to shell out another $200 bucks to actually make it usable. For me surface pro 4 don't even exist when we have the surface book. "For me surface pro 4 don't even exist when we have the surface book. Lets fix that shall we. Interestingly given the size of the display, they SP4 and Surface Book both have a 267ppi display giving them the same sharpness, just a different size. U got the sp4 i5 8gb.